Here’s my latest art – both traditional and digital. I made this slideshow with Google Slides on my iPad. 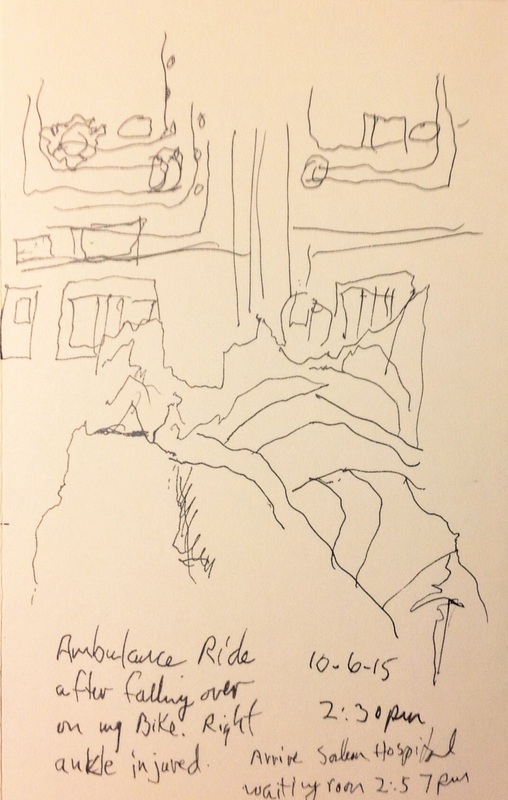 This morning I was looking at the sketch I did in the ambulance and began wondering how realistic or accurate a sketch has to be to capture a moment or describe an event. The lines are shakey. My foot is barely recognizable. Most people would judge it a “bad” sketch. Yet, for me, it takes me there and I remember everything. The EMT who was riding with me was named Patrick. I remember what we talked about during the ride, how long it took, what the route was, that the siren was not on…everything, and I realized that the amount of realism in the sketch was irrelevant. 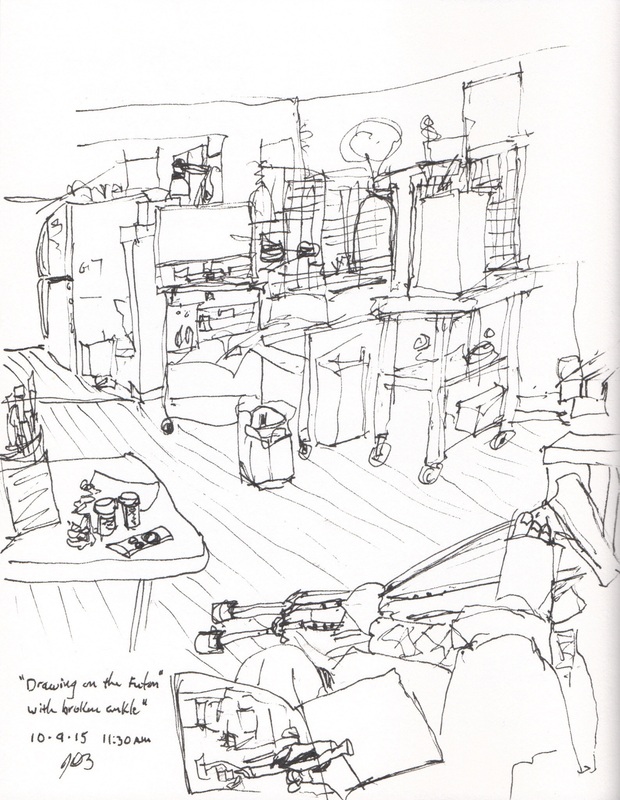 A sketch is a diagram of an experience. There is a crossover to other senses and memory neurons when you draw and it works much like a certain smell or melody does to trigger feelings or memories. 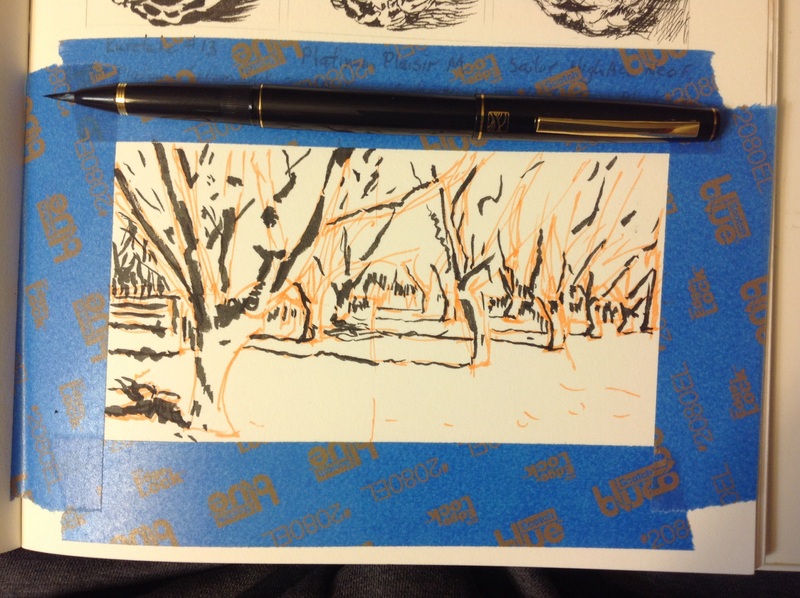 So, today, instead of doing a carefully layed out drawing of my surroundings, I’m doing a quick pen sketch. The proportions are all wrong, the objects look wonky, and the lines look scratchy, but that’s the place and situation all right. 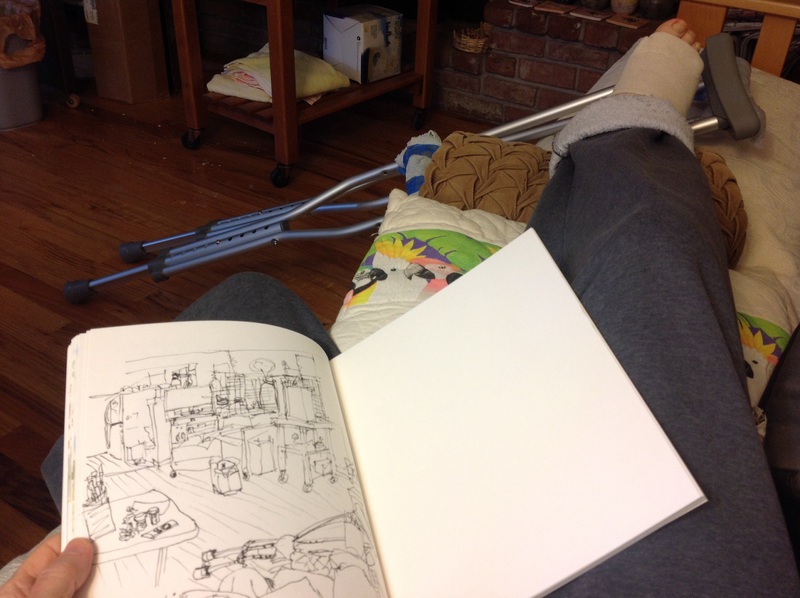 There is my bag of pens and pencils, my medications, my sketchbook, my foot in a cast, my crutches, and all the surrounding mess that is our family room and a bit of the kitchen. When I look at it, I know that the lines look that way partially because my wrist and arms hurt so much from using those crutches and I know that the pain in that foot has kept me awake for two nights. 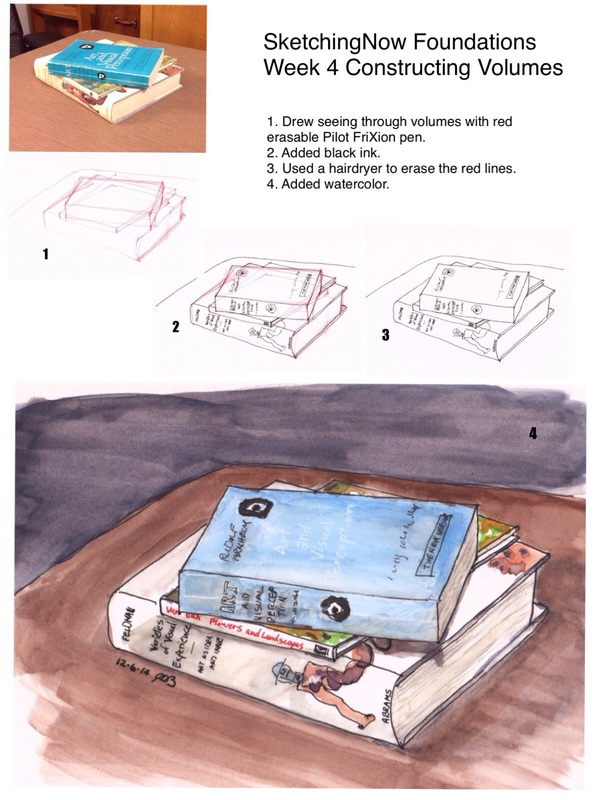 That is the magic of sketching. It’s a process of observing through movement of the hand and arm. The extra time and effort it takes makes it much more potent than a photograph. At least for the artist. I’m starting to get the hang of this sketching stuff. My proportions are getting better and I’ve developed a process I like. 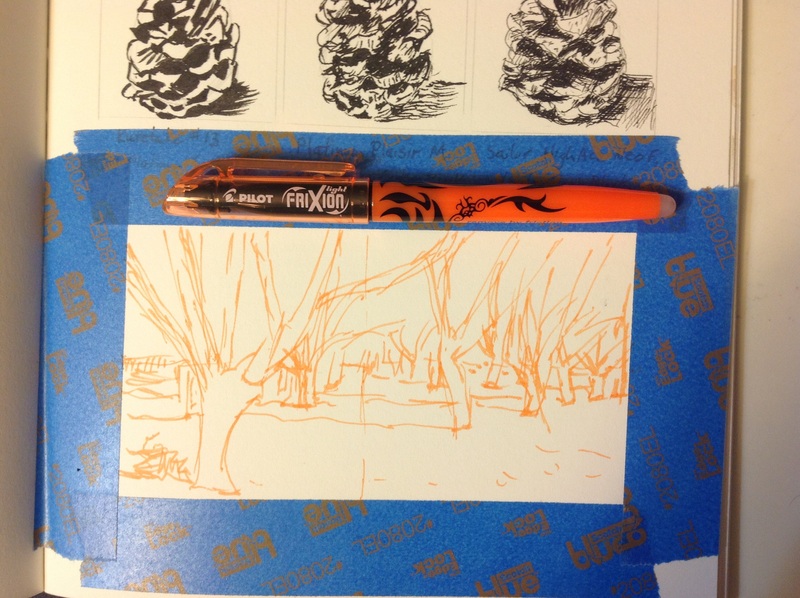 I start by framing an area in my journal with blue tape, and then I lay out the scene using an orange erasable highlighter. I divided the frame in half both vertically and horizontally and sketched in the major shapes in each quadrant. Then I drew the blackest blacks with a brush pen. Finally I added detail with an extra fine nib pen mainly drawing the darks rather than the contours. 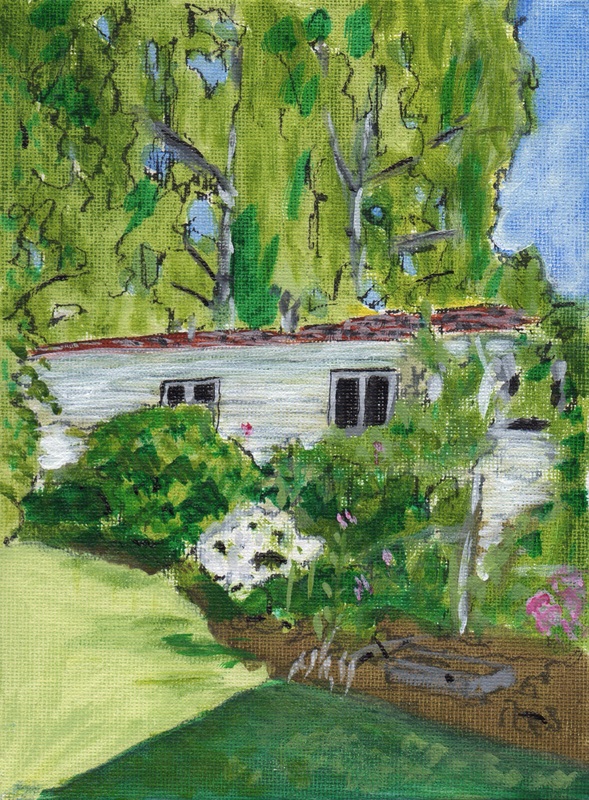 This is a small sketch – 5.5 x 3.5 inches. 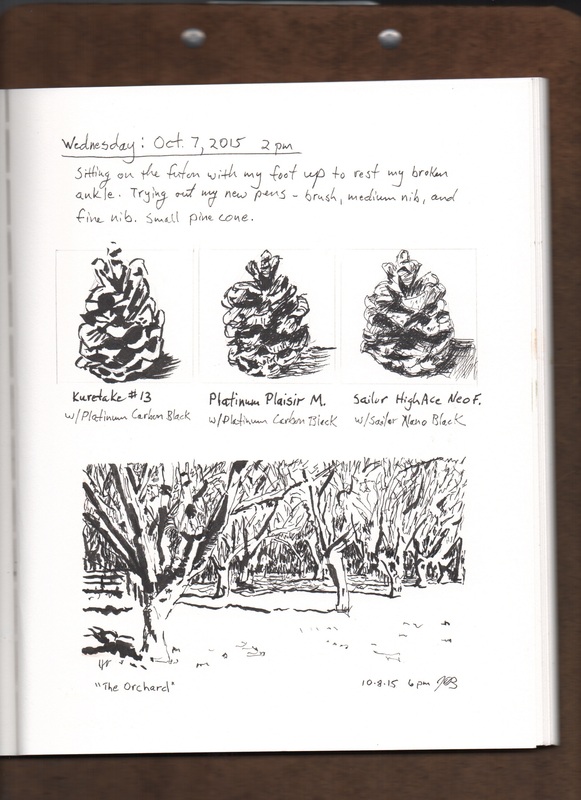 Here is what it looks like on the journal page. I then used a hairdryer to heat up the drawing which erases the orange highlighter. During the month of May I challenged myself to draw every day. I chose as my theme the flowers in our backyard. 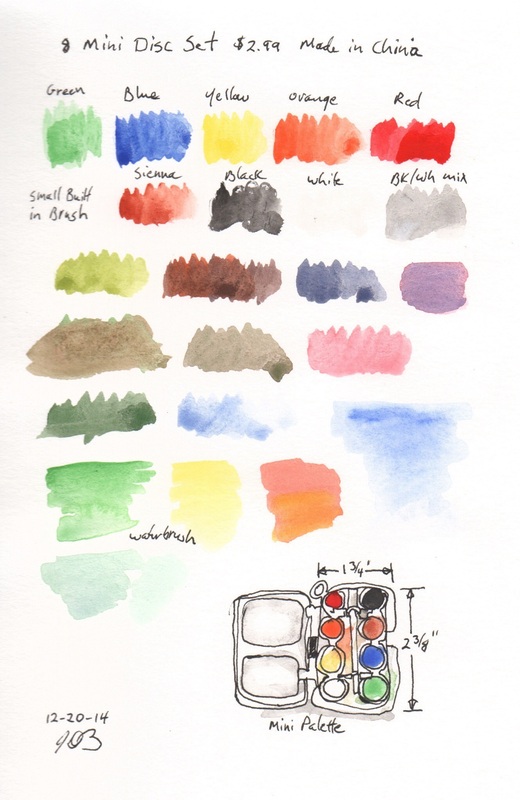 I’ve been spending the last month and a half writing a journal about the project, which contains a gallery of all my sketches and field notes about my methods, materials, thoughts, and discoveries. 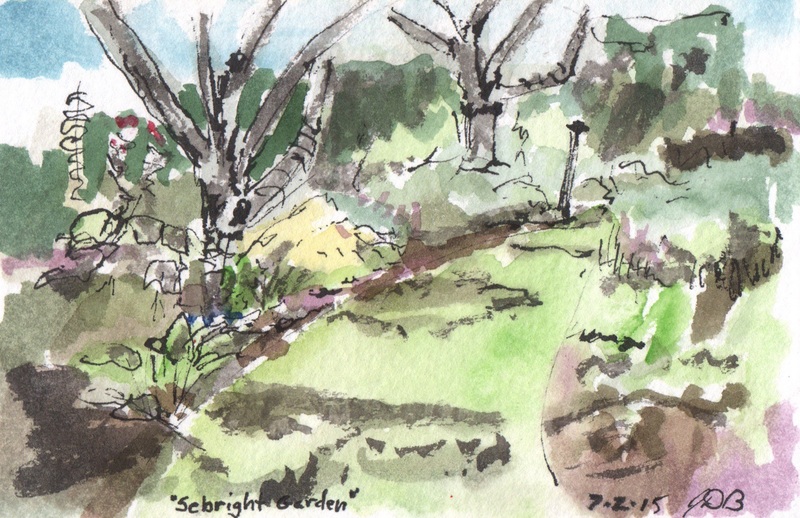 This morning I drove north to the Sebright Gardens for my first visit. Salem’s Artists in Action group was meeting there for one of their Paint the Town outings. So, in addition to checking out the garden I also wanted to meet the group. I talked with Melody and Merren and learned about the group and their activities and meetings. Both were very gracious and welcoming. “If I ever go looking for my heart’s desire again, I won’t look any further than my own backyard; because if it isn’t there, I never really lost it to begin with“. I’m continuing my quest to find the perfect materials for painting on location. This isn’t it, but I’m getting closer. Today I’m testing my homemade paint box before I take it out on location. I set it up on the back porch on top of my small Sony tripod. 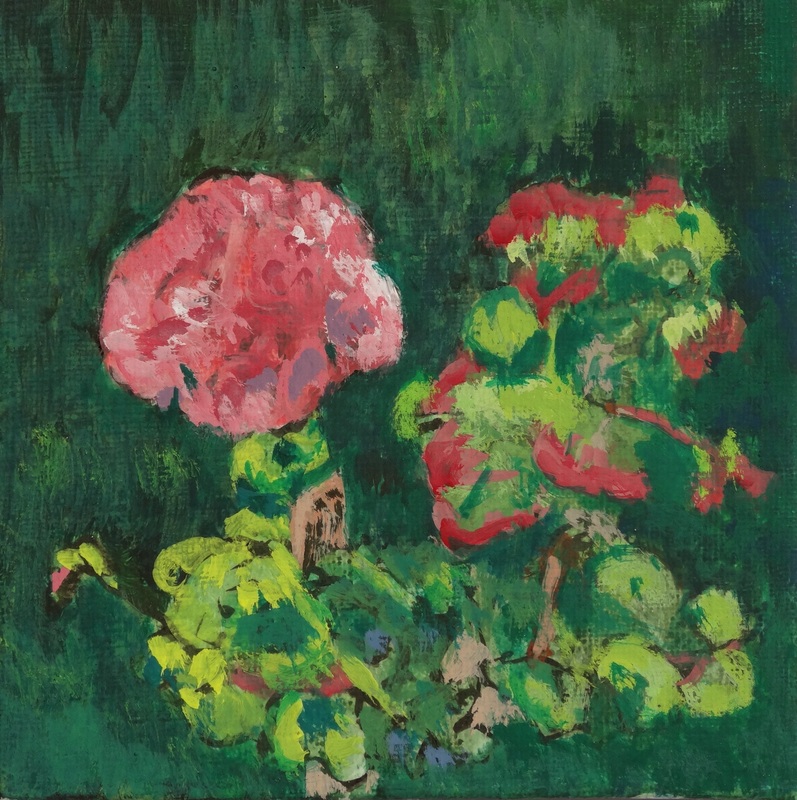 I’m painting with Holbein Acryla Gouache on a 6×6 inch canvas panel. 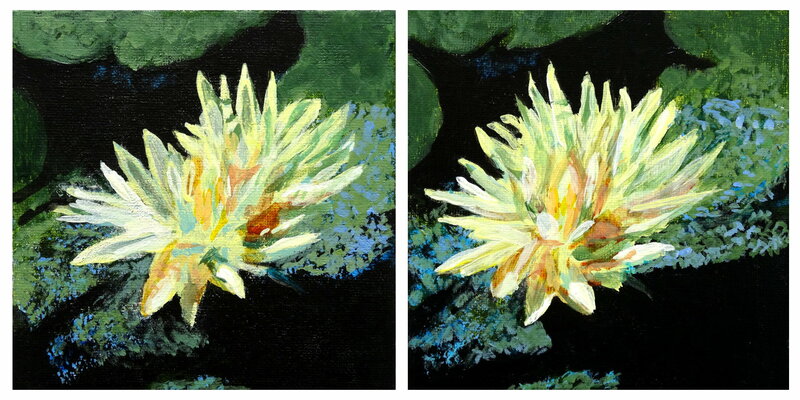 This is my second try at painting a pair of paintings at the same time. I like it. It goes faster than painting two separate paintings because you save time preparing and mixing the colors. I worked back and forth mixing a color once and applying it twice. 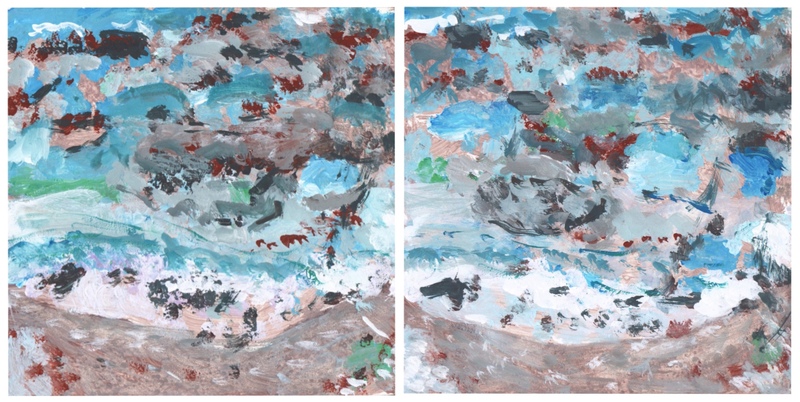 I’ve had this idea for a while now that I could do two paintings side by side of the same subject in about the same time as doing one. This is my first experiment to test my theory. I’m experimenting today using Epson inkjet glossy photo paper. 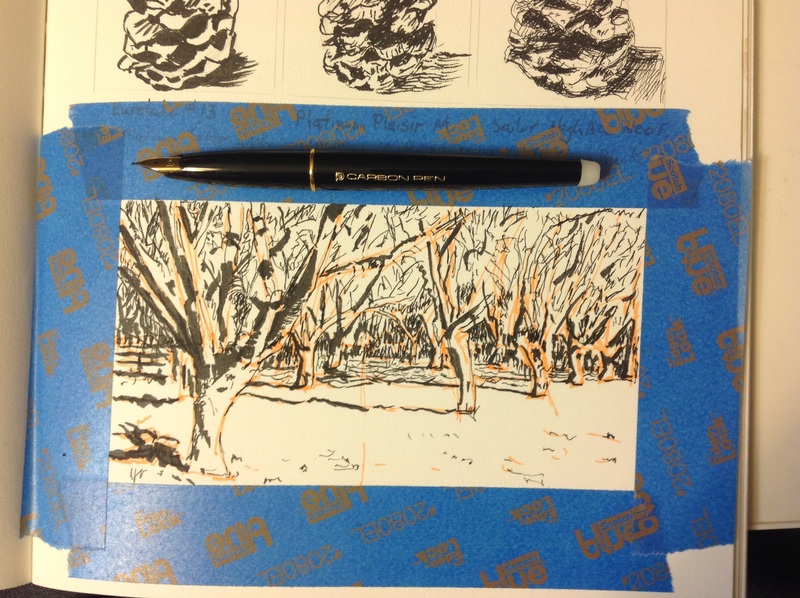 It’s an interesting surface to work on – unlike anything I’ve tried before. Today I drove Kris up to OHSU in Portland for an eye exam. The view from the 11th floor is spectacular. 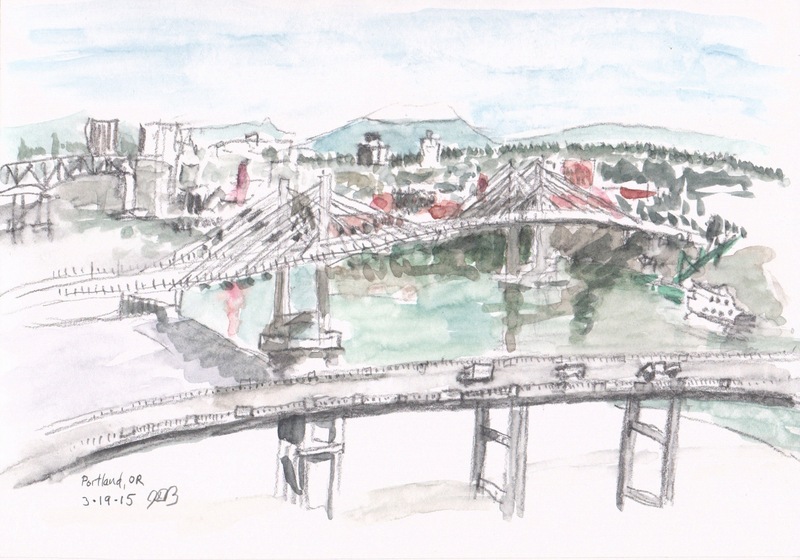 You can see three bridges spanning the Willamette river with Mt. St. Helens looming in the background. I sat near the window in the lobby to do this sketch. Saturday I drove to the Oregon Garden. Cold and clear. 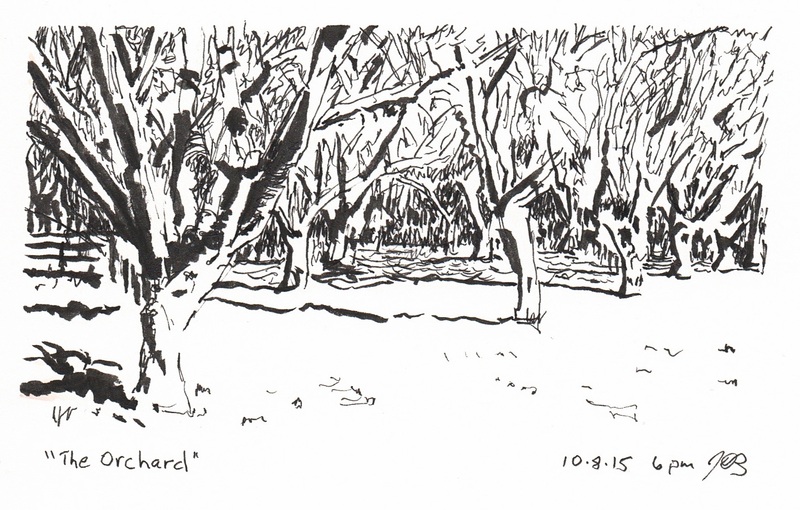 A perfect day to get out for a walk in the garden and catch up on my homework for Liz Steel’s Sketching Now Foundations course. 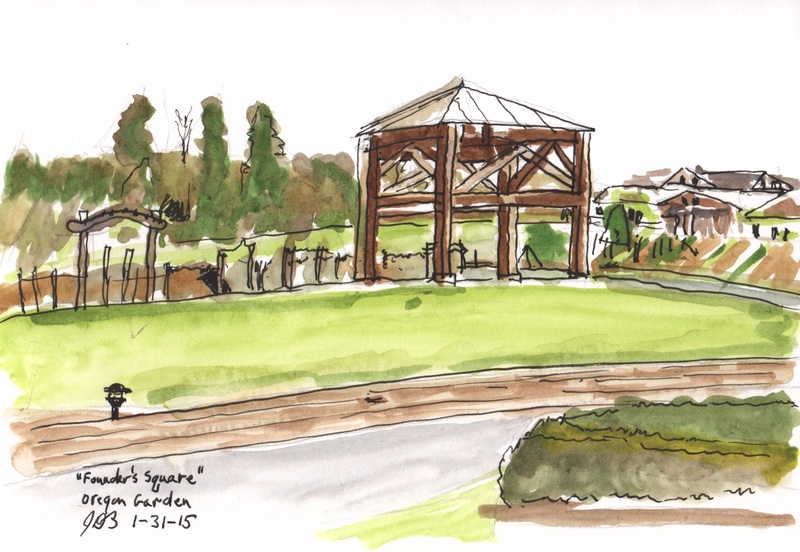 Founder’s Square is a large open structure that’s used sometimes for outdoor weddings. In the summer it’s surrounded by vegetable gardens. Up the hill is the garden resort. I knew ahead of time that I wanted to sketch either the resort or the large structure which is Founder’s Square. I have walked here many times and photographed the location from various vantage points. The view of the resort did not appeal to me. So, I walked around the square to pick the best angle for context. I wanted to show the structure’s placement in relation to the gardens and resort. I was also looking for depth and composition with a photographer’s eye. I picked a spot that had a foreground, middle ground, and background (for depth) and that was out of the way of foot traffic (although there was hardly anyone else around). I got some new watercolor paints for Christmas. Above are the original colors that came in a small toy palette I got as a stocking stuffer. The colors were really weak. So, I replaced them with my other major present which was a set of Daniel Smith watercolors. Week 4 assignment for Liz Steel’s Sketching Now Foundations course. We are learning to construct volumes. In this exercise we first draw a wireframe outline as if we can see through the objects. 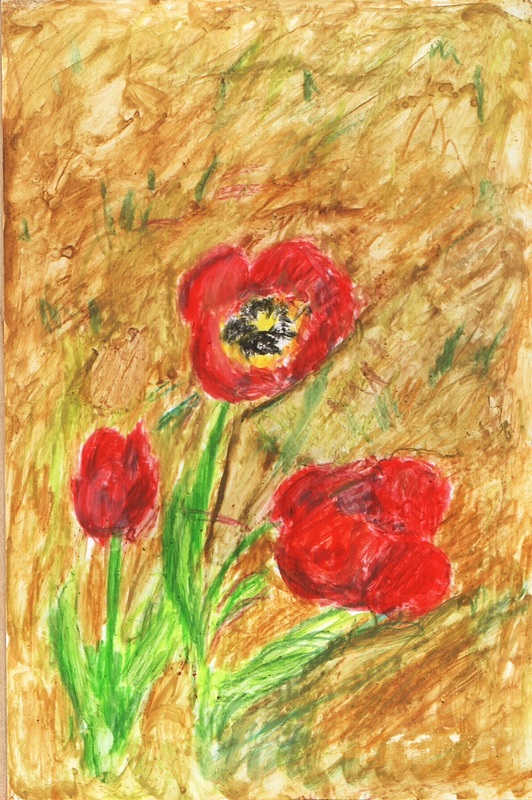 I used a red Pilot FriXion erasable pen. Then we add black ink, and then watercolor. I erased the red lines with a hairdryer (heat erases the FriXion ink, cold brings them back). These are three of my favorite art books – “Art and Visual Perception” by Rudolf Arnheim, “Van Gogh’s Flowers and Landscapes” by Janice Anderson, and “Varieties of Visual Experience” by Edmund Burke Feldman. I’ve been practicing drawing straight lines. I think it is starting to pay off. My lines are looking less wobbly. It’s hard to get the angles and sizes right. I didn’t get the top book right to start with and that effected everything else. Also, lettering is hard when it’s on a slanting surface. I didn’t know how to do white lettering. I used a white charcoal pencil, but it didn’t show up very well on the light blue book. Also, I need to practice doing background washes. I should start with a juicier mix and work faster. 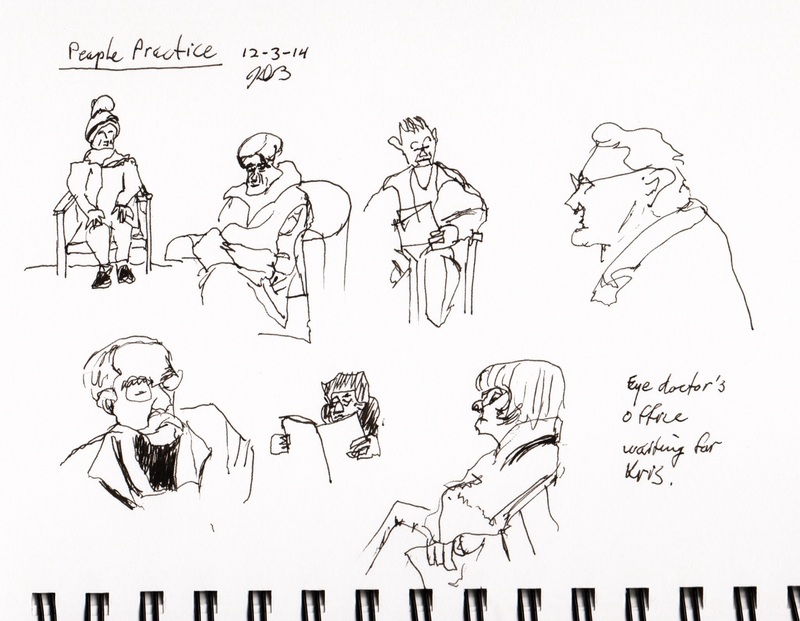 Drawing in the eye doctor’s waiting room. The place is crowded today. Lots of interesting faces. Some closer, some further away. Getting better with practice at capturing likeness and pose. Stillman & Birn Zeta series spiral bound 5.5 x 8 notebook, Kaweco Sport fountain pen with extra fine nib, Noodler’s Bulletproof Black ink. I also did one sketch on my iPod Touch just to compare. 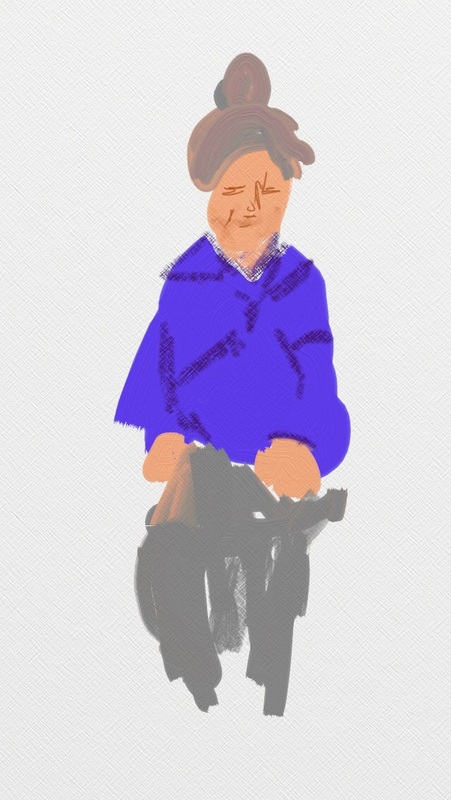 This was done using the ArtRage app. I was fighting the user interface. It’s hard to select colors and change brushes.